Challenge 7 sponsored by It’s So Easy asked our Top 6 to create a steampunk design on one hand (on a model) using any materials they’d like. They will receive bonus points for using out-of-the-box (non-nail) materials. This week’s guest judge was Jill McMurray of It’s So easy. Permanent judges include CND’s Jan Arnold, NAILS Next Top Nail Artist 2014 winner Ryoko Garcia, NAILS editor Hannah Lee, NAILS senior editor Beth Livesay, and the rest of the team at NAILS Magazine. Lavette Cephus: The judges thought your design had the perfect balance of Victorian and 20th century industrial aesthetic. You get a feeling of steampunk at first glance. The scientist and his awesome hat of wheels and cogs really make this design special. He’s the star of your design and we like the story you created around him. We also like your wire work, your color scheme, and the technique used for the goggles. We love that you made the clock say 5 o’clock to represent making it to the Top 5. We think this might be your best week yet. Your video was so much better this week. Good job on the tighter shots so we could see you create your design. We really appreciate you listening to our critiques and improving on that part of the challenge. It would have been nice if you used a few more unique unconventional items. 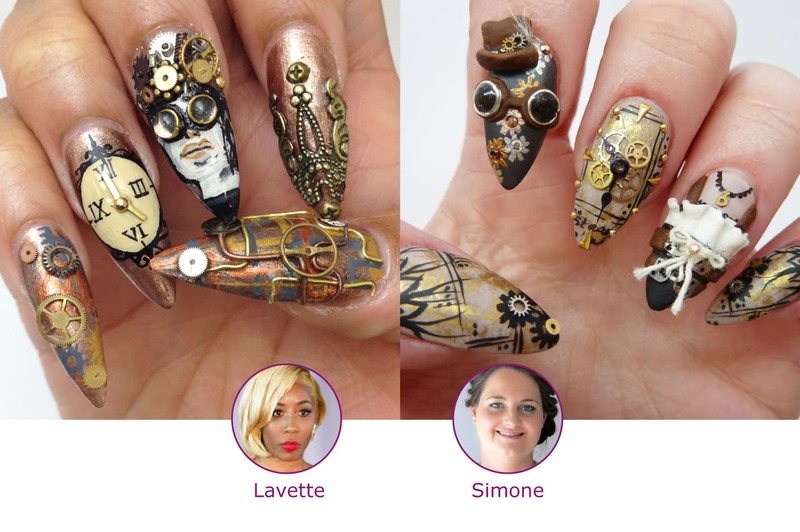 Simone Gilbert: The judges loved your clean, crisp take on the steampunk trend and we loved your explanation as well. The juxtaposition of the industrial hardware with the delicate painting and other feminine elements makes these nails unique. The hat and goggles are so cute and the 3-D pieces pop without being too dramatic in size, so this is still a wearable look. The patterns the three nails share are interesting, yet detail-oriented and modern enough to work with the overall design. The sculpted corset was so cool to watch you create. More unconventional materials would have gotten you a few extra points. Perhaps lower the music volume just a touch, it’s a little difficult to hear your voice in parts. The tips in your video were very useful. Your workspace is always so clean and we love seeing your work against it. Danielle Costantino: The judges love how you made the gears move on your design. This was a nice, unique touch that helped your design stand out. We also really like the feeling of the encapsulated pieces and your layering techniques. It really gives the design added depth and dimension. You show a lot of techniques. And we love the pop of pink with the flowers. We wanted to see how you painted the flower instead of using a photo. We like your decoupage technique and appreciate that you also added a few more details to personalize it. We wish you would have sculpted your own cameo. Some of the judges were left feeling like this might be too Victorian. This is definitely a wearable, pretty take on the steampunk trend. Your video is still a bit difficult to follow with a combination of photos, sideways shots, and upside down angles. Lexi Martone: The judges were in awe with your inspiration art and the execution of the eye. You always interpret the theme with unique, creative perspective. Your nails are bold and edgy, but they don’t scream steampunk the way some of the other designs do. The painted technique, combined with the gloss to create a realistic eyeball is amazing. As always, your work is crisp and clean. Using the gears as eyelashes is smart and unique. The clock arms you created are intricate and well done, but their size (and delicacy) make these nails less wearable. Your two foiled nails are well-done, but don’t push this design to the next level. However, watching you create them made them more interesting. We wished we saw more of what you gave us with the eye nail. Lauren Boyd: The judges thought your design is lovely with some great techniques but the design looks more Victorian than it does Steampunk. We love that you sculpted your own cameo out of acrylic! That’s awesome. The tiny beaded frame gives it great touch and we love the textured detail on the hair strands. We love the calligraphy love letter nail so much and the antiquing technique you used. We think more hardware and unconventional materials would have made this scream “steampunk” to meet the challenge guidelines better. But the nails themselves are beautiful. Your video is a little too fast and jerky — it jumps around a lot. Sherri Traweek: The judges loved that you named each nail and had real meaning and story behind each one. And you get all the extra points for interesting materials! Using a beetle wing is so cool. The screen door was a great addition as well. The texturing technique was also out-of-the-box thinking. We like the variety of your nails, but something is missing to pull them all together into a cohesive design. They feel a little too plain and simple. The shape of the nails looks a bit heavy and not flattering. It feels like you held back in order to make these wearable, but we feel like you could have pushed the envelope a little more in terms of design.